Businesses worldwide are challenged to conserve energy and resources while protecting the environment. 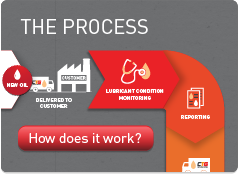 CTG Lubrication Services helps customers achieve these goals by providing PROPEL Oil Management, an oil renewal service that can prevent a customers’ in-service lubricant resource becoming waste oil. Being environmentally friendly often comes with a price penalty, but in line with the CTG mission, there is no cost penalty with PROPEL Oil Management, there is actually a cost benefit compared to the current cost of new lubricant purchasing. CTG’s mission – To champion an industry change from the lubricant “dump and replace” methodology by maintaining the highest quality oil, innovation and service, maximising our customers equipment reliability and minimising our customers’ lubricant costs and carbon footprint. Oil resource sustainability is about meeting the needs of the present without compromising the ability of future generations to meet their needs. By becoming sustainable using PROPEL Oil Management, you can reduce your environmental footprint and help preserve the world’s precious natural resource.